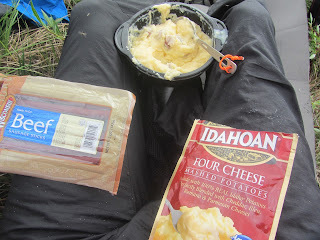 In the earlier blog posts on this subject I have written about calory needs while hiking (Part 1) and about the calory content in different kinds of food (Part 2). Now I will talk about examples of how all this can translate into different menus on the trail. Starting with my own menu for the last couple of years. I put a premium on low dry weight and many calories and that the food is edible. Edible to me I should say. That is about it, no gourmet stuff here. If you want to cheer things up or if you are a vegetarian I will talk about that in the fourth and last blog post in this series about food. Breakfast: 80 grams (a couple of years ago 100 grams, I need less food as I get older) of some sickly sweet muesli, perhaps with fruit flakes, from the supermarket. The muesli should have a calory content of at least 400 kcal/100 grams. I weigh this at home and put it in freezer bags with a tablespoon of dried milk (full fat if I can get it). In the morning I dump the contents of the bag into my cup and add water. Stir and eat. Packaging morning muesli and dried milk in freezer bags. I then take one soft mini tortilla from its excellent sturdy plastic vakuum package and roll it around a 10-12 cm/4-5 inch vacuum packed stick sausage (in Sweden sold in individually wrapped as 'beer sausage'). With this I have a cup of coffee. After that I am ready to go. Approximate calory content breakfast: 600 kcal. Lunch/dinner: I eat the biggest meal around noon. This is from habit, I grew up with it, and because I want my biggest meal when I need the calories most, which is while I am hiking. It is also a highlight during the day for me to have a long lunch break. People who want to do high mileage days usually skip this and just snack during the day, often on the move. But I am more interested in enjoying myself by taking it slow, looking at the trees and the views and relaxing when I am hiking. This is a personal choice, everyone should hike their own hike. Mashed potatoes and stick sausage. A favorite. Two days out of three I have mashed potato powder for lunch, about 100-120 grams of it. This often translates to a commercial bag containing three ordinary servings. In the US you can by Idahoans with different flavoring in most supermarkets. They are the best I have come across so far. Into the mashed potatoes goes the jack-of-all-trades, about 50 grams of stick sausage. Sometimes I replace this with some 40 grams of dried, grated cheese and a teaspoon of garlic powder. The third day, or when I feel like it, I have a commercial freeze dried meal for lunch. Both these varieties of lunch that I use contain more or less the same amount of calories. Approximate calory content lunch: 550-600 kcal. Evening meal/dinner: What I am about to reveal now will probably disgust you. 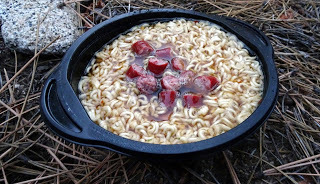 For the last five years or so I have been having noodles and 50 grams of stick sausage as evening meal every single day on my backpacking trips. The noodles are ordinary commercial 90-100 gram bags of Ramen or similar brands. The flavor packaging gives a bit of variety, sometimes it is Beef sometimes it is Shrimp or Oriental flavor that I have with the pieces of sausage. 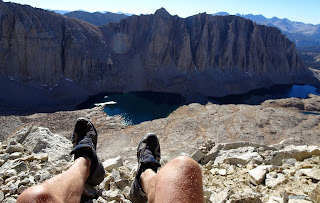 Hiking John Muir Trail last October, one evening a little voice in my head said: Hey, I do not like this, time to come up with something new. So I thought about this some. What can I say? Noodles and sausage..
Then, six months later, came Coast2Coast Sweden and sure enough, the noodles and stick sausage were back. They were OK. Well, I am still thinking about replacing them. However, theses noodles are cheap and practical, needing no cooking. I just pour hot water on them and eat after five minutes or so. So perhaps it is the sausage and the flavoring that I should replace for some evenings. Approximate calory content evening meal: 500-550 kcal. Summing up the above we find that these meals supply about 1600-1800 calories of my daily needs. So if I only ate these meals I would have a considerable calory deficit, as we have seen in Part 1. Where do the rest of the calories come from? Well, I usually hike between 7.30 in the morning until 7.30 at night. So my evening meal is consumed between 8-9 pm. Between that and lunch I stop for coffee around 4 pm. This coffee break also consists of a soft tortilla and some stick sausage, just like breakfast. This adds about 200 kcal. With the coffee I also have some of my regular snacks. I stop for 5-10 minutes every hour, come hell or high water, and sit down. 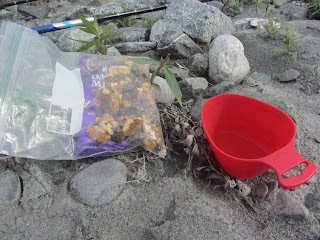 I have a cup or two of water, depending on the weather (I seldom hike in really hot areas) and some snacks, on this hourly basis. This keeps me from becoming dehydrated and low in blood sugar. I am almost always in a good mood and loving my hiking. Every day I consume the following snacks: 100 grams/3,5 oz. of chocolate, the same amount in nuts and 50 grams/2 oz of raisins. This gives me a useful mixture of sugars that enter the blood stream immediately, and more slow acting fats. Approximate calory content snacks and coffee: 1450 kcal. Hourly break: Water and some chocolate, nuts and raisins. So my total calory intake for some serious hiking in some remote and not so remote areas is 3200 kcal/day. (I erroneously wrote 3700 kcal/day in an earlier post. That was old data and I have corrected it now, after doing the math on my current menu). This is obivously enough for me to hike on, not suffer serious blood sugar crashes nor lose much weight even on multi week hikes in demanding terrain. The current stats on me is that I weigh 80 kilos/195 lbs on a 190 cm/6 feet 4 inch frame. I am also 60 years old and can remember when I was 25 and probably would have needed at least 50 percent more calories per day to keep me happy. So calory needs are highly personal and the best way to find the proper level is trial and error. By supplying my current menu I hope you will not start so far away from your personal needs that you suffer too much before you have it down to something that will keep you warm, comfortable and capable in any situation. 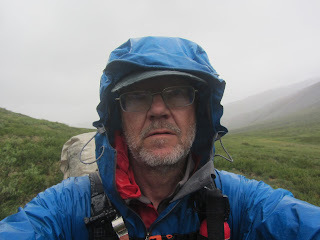 In the next and last blog entry food a k a energy on the trail I will talk about alternatives regarding calories and food stuffs. For instance, vegetarians would need something other than sausage sticks that will supply similar amounts of protein and fat or other energy.